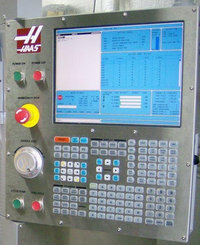 Haas Parameter 410 V EXACT STOP DIST. This parameter controls how close the axis must be to its end point when exact stop is programmed. They apply in G09 and G64. They are in units of encoder steps. A value of 34 would give 34/138718 = 0.00025 inch. To change the value of this parameter permanently, the machine must be rebooted.